Whether you are a construction owner, worker, or a trainer of the industry, you need to be aware of the changes coming to the workplace. As of July 1st, 2014, the green Construction Site Operative (CSO) card has been withdrawn. The reason being the system was being abused by site workers who found that applying for the green CSO card was the easiest route to gain access to a construction site. When this method was called into question, contractors found that CSCS cards were no longer a reliable source to prove the appropriate skills of safety in construction sites. Currently, the CSO card is now being changed to a Labourer card test. The green card was originally developed for entry level workers who were only required to pass a Health, Safety, and environment test. In the beginning, the card was meant for workers who were meant to provide “labouring duties only.” As mentioned before, this privilege was soon taken advantage of and abused. The situation was addressed so that employers could rest easy knowing their workers could do their jobs safely and effectively. Below we have broken down how the green card change will affect you depending on your position on a construction site. A QCF Level 1 or SCQF Level 4 Award Health and Safety in a Construction Environment course, a One Day Site Safety Plus Health and Safety Awareness course, an IOSH Working Safely course, or a recognised equivalent of these courses. An important factor to remember is that the employers who offer training equivalent to a Level 1 Award Health and Safety in a Construction Environment may have their course assessed to see if it will be sufficient. If not, your employees will need to pass a CITB Operatives Health, Safety, and Environment test within two years of applying for their new Labourer card. 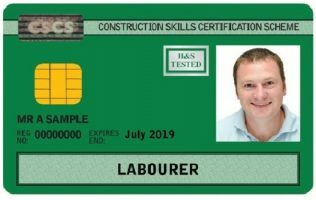 If your employees already have the green card, they will be accepted until they expire and then they will need to apply for the new labourer card. Labouring Occupation and Non-labouring Occupation. If you plan on working in a labouring occupation, you will need to apply for a labourer card. The Green Card will no longer be efficient as the evidence has shown an abused system. Many workers are in question as to why they must now do a training course in order to work on a construction site. The simple answer would be to train and assess future workers. The CSCS wants to ensure that workers are aware of future job tasks such as: working with equipment, working at certain heights, manual handling, and the risks that come with the job. By doing so, an employer can have a consistency in his workers if they are aware of the Health and Safety in a Construction Environment. Another question being raised is if there is an equivalent to the new Labourer card. If you have either the SMSTS or the SSSTS, the answer is no. The reason being that the courses stated do not have the same content as the new labourer card because the courses are meant for site managers and supervisors. All employees will need to take the Level 1 Award Health and Safety in a Construction Environment to continue the line of work. Pearson, Cskills Awards, or City & Guilds to find a testing centre. Depending on one’s previous experience, the cost of delivering the new award will change. The total cost of the test is dependent upon: training, award assessment, as well as a pre-assessment. For further details, one should contact their training provider to see exactly how much training will be required. As a training provider, you may have employees coming to you to learn about the new Labourer card. It is your duty to provide the confused workers with knowledge of the process. Understand that no, the green card and other training courses are not equivalent to the Level 1 Award Health and Safety in a Construction Environment. A trainer should be aware that the cost of the training will vary dependent upon the individual’s previous experience. Also, one should be aware that the award is regulated by Ofqual and is assessed in English, Welsh and Gaelic. If a worker asks for the test in a different language, see if you are able to provide them with so. If you follow the information provided above, you should be able to carry on with your construction job. Be aware that you will need the new Labourer card, how to obtain the card, and which training you will need. Best of luck on your future endeavours!